"We're expecting Obama to swing the thing around. He's got good advisers on board." Nobel prize-winning scientist Sir John Sulston reflected the views of many scientists when he welcomed the victory of Barack Obama in last year's US presidential election. Concerns such as the continuing conflict in Iraq and the domestic US economy may have been most prominent during the election campaign. But scientific and environmental issues were also high on the agenda. On two specific areas - stem cells and climate change - Mr Obama's advisers sought to distance his campaign from the position taken by the Bush administration. For scientists like Professor Sulston, who led the UK portion of the public-sector bid to sequence the human genome and now chairs the newly formed Institute for Science, Ethics and Innovation at Manchester University, this distancing comes as a relief. 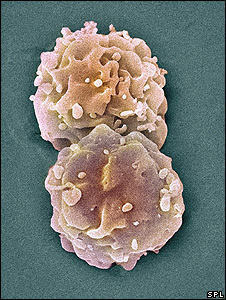 "The attitude to stem cells is just one aspect of the anti-intellectual nature of the Bush administration," he told BBC News. "They've been tampering with the evidence, turning very heavily on a constituency that has very specific views." Barack Obama's team has been guarded on many policy issues; but in discussing science and environment, they have provided some answers. This is partly in response to a campaign calling for an open debate on science policy, set up by US screenwriters with the support of leading scientists. Thousands of people got involved and were asked to submit questions to be put to the candidates. Screenwriter Shawn Otto, who founded the Science Debate 2008 campaign, says one of the most surprising answers was to a question about future policy on greenhouse gas emissions. In his response, Barack Obama outlined a policy known as "cap-and-trade", a proposal similar to the the EU's Emission Trading Scheme (ETS). The plan would see permits to pollute being auctioned, with the money raised used to develop effective renewable energy systems and protect wildlife habitat. "Potentially the cap-and-trade system could bring in trillions of dollars, and it should be easier to restructure energy law as they're already in restructuring mode," says Mr Otto. Apart from his responses to Science Debate 2008, Mr Obama also outlined some policies in replies given to the journal Nature in September 2008. "I will lift the current administration's ban on federal funding of research on embryonic stem cell lines created after 9 August 2001," vowed the president-elect. This not a complete reversal of the Bush position, as Mr Obama suggests only embryos surplus to in-vitro fertilisation could be used for developing stem cell lines in the future, rather than all or any embryos. As for space, there will be a centralised body to oversee development of all technology, as there was in the 1960s. "The National Aeronautics and Space Council oversaw the entire space arena for four presidents; the council was briefly revived from 1989 to 1992," said Mr Obama. "I will re-establish this council reporting to the president. It will oversee and co-ordinate civilian, military, commercial, and national security space activities." When it comes to climate policy, he recognises that the US needs to be party to international negotiations. 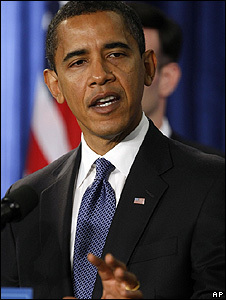 "First, the US must get off the sidelines," Mr Obama said. "This is a global problem. US leadership is essential, but solutions will require contributions from all parts of the world." This stance was put into practice when he recently announced the appointment of John Holdren as director of the Office of Science and Technology Policy (OSTP). "Today, more than ever before, science holds the key to our survival as a planet," the president-elect stated. Wangari Maathai, Nobel Peace Prize winner and leading African environmentalist, says there is a lot of goodwill for Barack Obama across the continent. But her message on climate protection is simple: protect the remaining equatorial forests. "The US needs to agree that protecting the standing forests is part of the solution for climate change," says the former Kenyan environment minister and founder of the Green Belt Movement, an NGO concerned with reforestation. Mr Obama has talked about generating electricity from renewable sources in the US, and Professor Maathai would like to see a more global vision on energy policy; a plan that moves away from the biofuels so favoured by President Bush. "Move from fossil fuels towards better and cleaner energies, to invest in technologies and make technology available to developing countries, instead of using food crops for energy," is her prescription. However, she does feel the US needs to take the initiative on issues such as emissions reductions. "Other governments know if America is not interested, it won't go very far." The appointments of President-elect Obama's scientific advisers have been widely welcomed by leading scientists. For example, the chief scientific adviser for the UK Department for Environment, Food and Rural Affairs (Defra), Professor Robert Watson, described the choice of John Holdren as "outstanding". But there are still questions about the amount of political clout that scientists will really have in the new US administration. Currently, the chief scientific adviser is not a cabinet level position, although it has been during some administrations. Shawn Otto says: "We don't yet know if the position will be elevated to cabinet level. "I think that's very important in an era when most of the nation's major policy challenges revolve around science and technology. "The president can't make fully informed policy decisions without taking the science into consideration, so having that voice in cabinet discussions is very important."